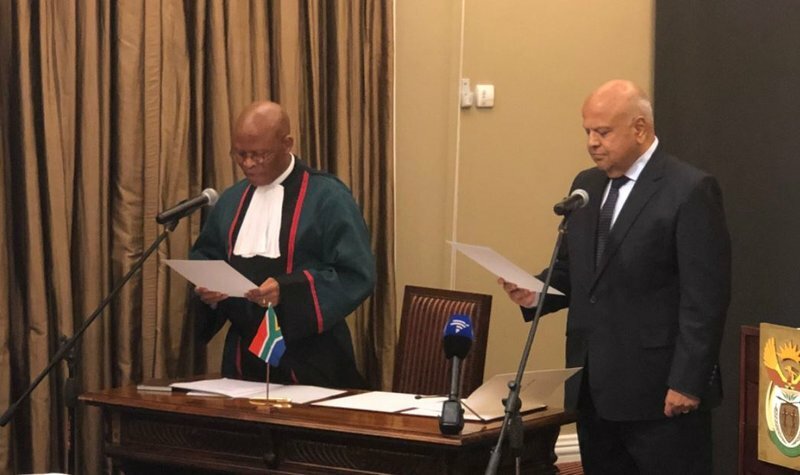 Chief Justice Mogoeng Mogoeng did not hold back when he swore in new members of President Cyril Ramaphosa's cabinet at Tuynhuis in Cape Town on Tuesday afternoon. "May the oath or affirmation judge most brutally any of us that are here for a show." It could be seen as more than just a swearing-in ceremony, with Mogoeng forewarning the newly appointed deputy president, David Mabuza, and ministers to respect the Constitution - or face the consequences. Mogoeng admitted that he could have shifted the task of presiding officer to another judge, but he couldn't "as we conscientise ourselves as deputy president, ministers and deputy ministers about the profoundity of the responsibility we are about to assume." He reminded the office bearers "that it's not about resources distributed to your department or section so that we can now begin to look like we owe you something, it's to become a servant." Deputy President David Mabuza, Minister in The Presidency Dr. Nkosazana Dlamini Zuma, Mineral Resources Minister Gwede Mantashe and Public Enterprises Minister Pravin Gordhan were among those sworn in.